First and last time I came across Cattle Decapitation was with the release of their “Ten Torments of the Damned” 7” in the mid-'90s. Fast-forward a more twenty years, and their mélange of grindcore, power violence and metal has made them a veritable big player in the more violent realm of what is labeled as Death Metal. 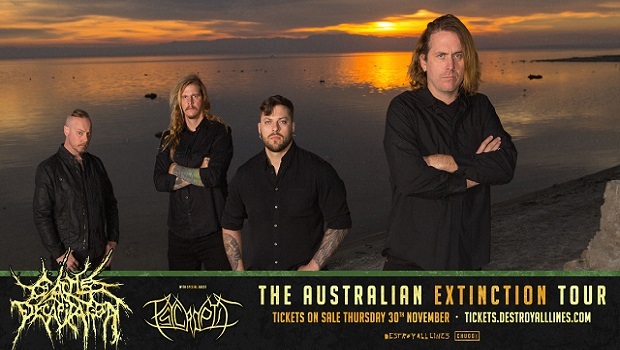 Cattle Decapitation’s appeal back in the day as well as in 2018 is that it is not merely an exercise in being extreme for the sake of shock value, but it is solidly based on their credo and disgust with the way the race of humankind is devolving. In a live environment, Cattle Decapitation is a precise, well oiled machine that is surprisingly nuanceful when it comes to administering their technical assaults of brutality, effortlessly amplifying velocity or stripping it back, all with their own groove to play with dynamics and keep the audience on its toes. With a lot of the bands of Cattle Decapitation’s ilk, novelty vocals run danger of quickly outlasting their allure, but somehow Travis Ryan manages to keep it at an interesting level throughout their performance running the gamut of extreme onomatopoeia, which serves as an instrument in itself. Brutality and controversy, which is often based on their explicit cover artworks and the band crossing into more mainstream waters, aside: Cattle Decapitation is first and foremost an accomplished band that does not have to rely on shock antics and tonight’s show was a testament to their virtuosity and song-writing abilities. It was interesting to see how they have evolved and started to incorporate to subtly incorporate melodic passages, which gives their onslaught another dimension.